Is there anywhere that defines the WBC's allowed in CSF that can be considered normal (i.e. : not concern for meningitis)? Because if I do the subtraction for RBC's, will it have to come down to zero? I have used 2 or less for adults because that is how I was trained but not sure if that is evidence based or applies to children. In terms of correction, I was never much of a fan, but there was a big PECARN study published in May 2017 (Lyons et al.) which basically found that 1W to 877R was the ideal correction factor. Thankfully, they found that 1:1000 worked about as well and was much easier. However, there were some missed in the 0-28 day group, so they suggested applying this mainly to the 29-60 day olds. They used 10 as their WBC cutoff in 29-60 day olds. However, the Philadelphia criteria use <8 as the cut-off for CSF WBCs for low risk and that is what I have always used. Under 1 month, 15-30 is thought normal, and for the purposes of this study, they used 20. I am not sure about the literature for neonatal but ultrasound guided LPs are awesome for adults with challenging anatomy. I still don't quite have the hang of ultrasound for LP, but it is on my New Years resolution list! If you use it effectively in adults, you can probably extrapolate to kids. 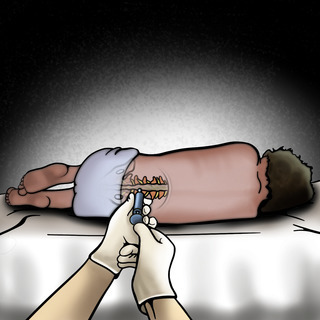 There is some pediatric literature indicating increased first-attempt success rates with US, but an addition of 5 minutes to the procedure (May Annals EM). Like everything, a trade-off, but for those who find neonatal LPs to be the bane of their existence, US can potentially make them ~25% less so! Even with US, though, there is a decent failure rate- I presume from all the squirming AFTER landmark location. I’ve been removing the stylet early in adults for years - what are the reasons you do it in kids but not adults?